I had no idea I love and can wear Ysatis, the 1984 perfume monster from Givenchy. My sister used to wear it at some point during our late teens or early twenties, and I'm pretty sure our mother is still traumatized by the memory of Ysatis clouds hanging in the air between the bathroom and my sister's bedroom. But apparently I've been missing out on a fantastically dirty floriental that's quite old school 1980s. I love my big florientals, from the original Tiffany to Panthere de Cartier. Like Ysatis, they have a bold white floral core and more than a little cleavage. Ysatis, despite the Givenchy pedigree and its Dominique Ropion parentage smells like a bold Italian perfume more than a grandchild of Le De or L'Interdit. Then again, who looked or smelled like themselves in 1984? Ysatis is not for the meek or for those still figuring out their taste and style. This perfume will steal the show if you let it, so the wearer should know how to rule the sillage, leash and unleash it and own it till the last creamy drop. just outside my sister's old bedroom. Notes: citrus, ylang-ylang, galbanum, coconut, rosewood, aldehydes, jasmine, rose, iris, tuberose, narcissus, musk, amber, vanilla, vetiver, patchouli, sandalwood and civet. Other bloggers reviewed Ysatis: I Smell Therefore I am, Yesterday's Perfume and Scentzilla. 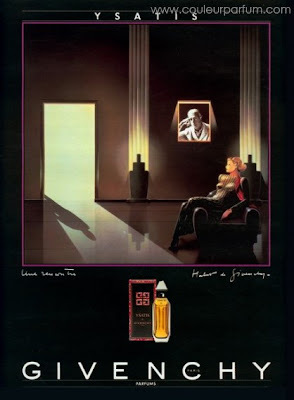 "Then again, who looked or smelled like themselves in 1984?" Thanks for my morning guffaw, Gaia! WANT Ysatis in extrait. Now I'll be on the hunt... Because surely the parfum has less monster sillage, yes? I loved it and wore it. Thanks for reminding me of lovely times! I wore Ysatis and loved it! Thanks for reminding me of great times. 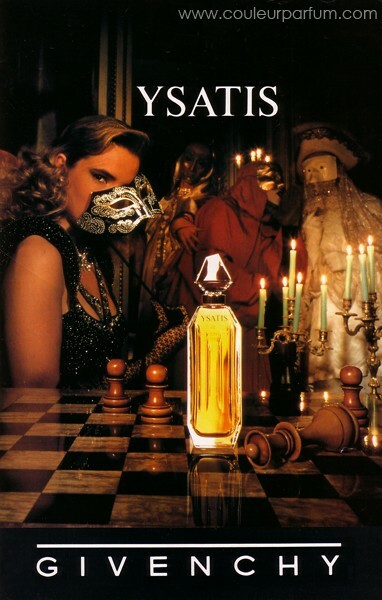 I so loved the original Ysatis in the eighties, it was one of the favorites along with Poison and Opium! I adore Ysatis, it was my grandmother's scent for many years. I have a nearly-empty vintage bottle of hers from the late 80's and it's wonderful. 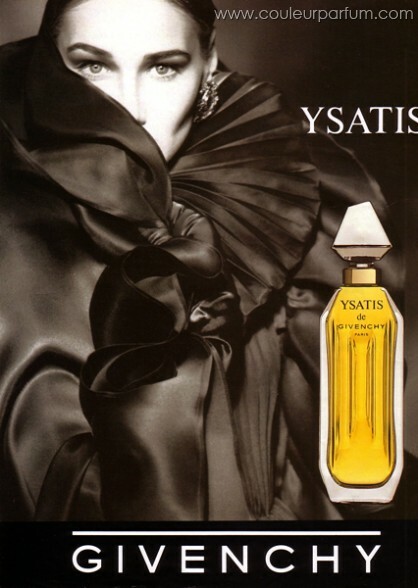 Ysatis also had a body cream that was a whipped cream/gel formula, loaded with the real perfume, and light yet rich, it was my favorite in the winter. Hello Ladies, I am a man and I am trying to fulfill an old wish from my mother. She has a very good touch for choosing and wearing perfums and she asked me when I travel to Paris to buy her the original Givenchy Perfum Extract for women. I remember as a kid she had a little whyte box with a little bottle inside and that was her most wanted perfum ever. So, I believe I am talking about this perfum from Givenchy "Eau de Givenchy" for women. Question: Does any of you know where in Paris can I buy it? The Givenchy's Stores in Paris would be the best place to find it? What do you suggest? I would be very glad with any help you could provide me. My mother has 78 years old and I want to bring her at least three of those bottles for her when I come back to Brazil where we live. in Thanks in advance!! !